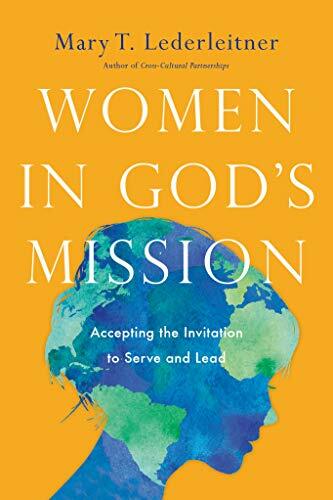 Women in God’s Mission: Accepting the Invitation to Serve and Lead by Mary T. Leiderleitner. Downer’s Grove: Intervarsity Press, 2018. This book is a summary of Dr. Mary Leiderleitner’s research into how women are serving and leading in God’s mission around the world. Her research was framed by two questions: 1) “What are diverse women experiencing as they lead in God’s mission? and 2) “What do they believe they need in order to do their best work as leaders in God’s mission?” These questions were answered by 95 women from 28 countries through interviews, written surveys, and focus groups. She includes a lengthy explanation in the appendix of her research methodology. I met Dr. Mary Leiderleitner last September as she co-facilitated a course I took entitled “A Global Vision for Women.” The book wasn’t published yet so I didn’t have a signed copy. However, I did find myself hearing Mary’s voice in my head as I read it – like a free Audible Version! While this made the experience of reading that much richer for me, even if you have never had the privilege of meeting Mary, I believe this book is still a rich experience for anyone involved in God’s mission. While it doesn’t tackle theological debates about what women can or cannot do in God’s mission, it does show how women are navigating this terrain to be effective leaders. Her discovery of the 7 traits that make up what she calls the “Faithful Connected Leader” model is informative for both men and women in leadership. She also explores how women navigate various barriers including gender and how men and women can flourish in kingdom partnership. These principles and practical insights into how women lead could be used to inform best practices in organizations for mentoring leaders and to create positive work environments in mixed gender teams. As someone who has been leading in God’s mission myself for the last 10 years, I was curious to read how other women’s stories paralleled my own. In addition, I wanted to see how research across cultures (over 25 represented) could inform best practices for both my personal leadership and my organization. The book delivers on all of these accounts. The book is organized into four sections: Appreciating the Stories, the Faithful Connected Leader, Realities of Gender Discrimination, and What Women Need to do Their Best Work. While the first section is primarily focused on stories, Mary employs a story-telling approach throughout the book. I found this refreshing as it brings life to research and shows what real women go through in their very real contexts. I found the individual stories inspiring as I read about women who have had to overcome much larger leadership challenges than what I have had to face. In Part 2, Mary unpacks the “Faithful Connected Leader” model that is made up of 7 distinct traits. While I personally resonated with each trait, I also found it quite incredible that these were true regardless of cultural background or even generational differences. A foundational belief that leadership is not about them but about God and obeying Him. A deep commitment to prayer because knowing God personally is more important than the work. Perseverance, despite difficulties and injustice. They care intensely about ministry impact and actively monitor this for themselves, those they lead and their organization. They model a commitment to excellence in their profession and are intentional about personal growth. … can take heart that we are doing well if we choose to be part of the solution by becoming better people in the midst of gender challenges, and by using what power we do have to model Christlikeness. Without glossing over the very real pain that many have experienced because of discrimination, the book moves into positively addressing how men and women can work well together. The author focused on 4 areas: relationship of husband and wife (if married), the metaphor of the sacred sibling, men who courageously open the doors for women, and a spirit of encouragement. One of the most surprising applications in this portion was Leiderleitner’s observation that all the women she interviewed “… .seemed to be married to the same guy” (Loc 1953)! Regardless of the husband’s occupation, they all seemed to be able to set aside their own comfort and take genuine joy in their wives accomplishments. The research seemed to show that if women are not married to this type of man, “a married woman’s leadership journey will be far more difficult” (Loc 1975). As many readers of this blog are husbands, I find this point worth emphasizing. This chapter includes helpful reflections on Christ and his bride and could be a good starting point for couples to consider together. There are many practical takeaways from this book but without the engagement of every individual in this discussion, they will only remain inspirational stories or interesting insights. The 7 traits of the Faithful Connected Leader are aspirational for anyone in leadership — from the importance of prayer to perseverance to a commitment to excellence and lifelong growth. However, there are many areas where individuals and organizations can work to promote greater understanding between men and women and remove barriers. This book is a step in that direction. What is the next step you can take to ensure that the women around you are flourishing as they serve in God’s mission?